From the beginning, the Temple’s primary goal was integrating the community. Their dream was to see the existing campus reimagined in a way that would bring its fragmented elements—spatial and social—together. The challenge of creating a unified campus that brought together the school and temple into a single community was achieved through the implementation of the master plan: opening the circular school to the larger campus created that connection. The tying of the two administration groups into a single grouped office helped to strengthen this connection. Today, parents dropping their kids off at school don’t run off to do errands but hang out in the living room to schmooze with other temple members – a realization of the temple’s central mission. Our project’s objectives were to reorganize the campus to better meet the goals of Temple Beth Sholom. We began with a campus master plan, creating connections with clear way-finding, identity and procession. New school facilities, community meeting spaces, and sacred spaces are all expressed in a consistent architectural vocabulary. Visitors move from the most public realm entering at the front gates through the front porch and entry doors and into the warmth and community of the living room. The procession continues through the gallery - lined by a wall of remembrance and affording a view into the adjacent meditation garden, this is the place to stop and reflect. The procession concludes in the most sacred spaces of the temple: The Chapel and Sanctuary. Richard Berliner was a true visionary when it came to imagining how to best transform our previously dysfunctional facility into an integrated campus. Through thoughtful planning and a combination of the renovation and the insertion of new structures the campus was reinvented to better serve the temple community. Project Manager - JR van Dijs, Inc.
A primary consideration in the design of Temple Beth Sholom was the representation of Jewish culture and history through architecture. Dividing the livingroom and sanctuary is a wall of Jerusalem stone; the base of the chapel facade is lined with the same material. These rough-cut stones - the same material used for ancient temples in Jerusalem - create a clear visual connection between Temple Beth Sholom and its forebears. 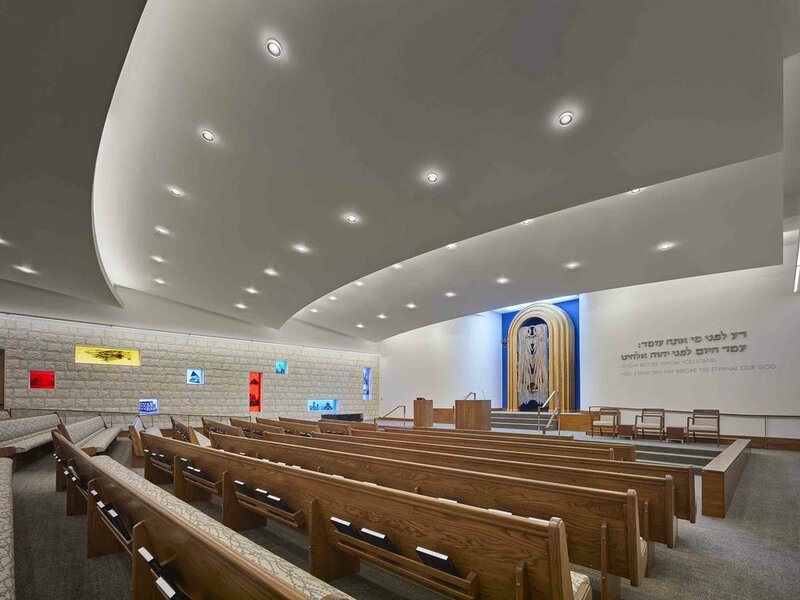 The connection is reinforced by inset colored glass panels depicting nine significant Jewish Temples throughout history, these panels subtly place TBS in the canon of significant Jewish Centers of worship. The chapel, circular in plan, reflects the timeless and eternal. A cloud-like ceiling representing the heavens above is suspended over a continuous wall of iridescent glass. The ceiling floats above, supported by twelve slender columns representing the twelve tribes of Israel. Continuously changing light and shadow create a sense of connection with the unseen.